Theories on global warming aside, the scientific community predicts there is a greater than 57% chance that 2017 will turn out to be the second-hottest year on record. During June there were 4,343 warm daily high (1,848) and low (2,494) temperature records. Specifically, high temperatures were between ten and twenty degrees higher in the upper Midwest eastward into the northeast and mid-Atlantic. Over on the west coast, southern California experienced record high temperatures. Death Valley, California hit a record-high temperature of 127 degrees, and Phoenix, Arizona suffered temperatures reaching 119 degrees. Not only are the temperatures miserable, but the heat also has affected aspects of everyday living. In Arizona, over forty flights were cancelled in one day because of the extreme heat. On the day Arizona endured unprecedented record-high temperatures, the state also broke energy consumption records—three of the largest utilities all broke their records for most simultaneous electricity use. Texas has already set two monthly records in energy demand. The Electricity Reliability Council of Texas (ERCOT), which manages the power grid for most of the state, said its customers used 67,512 megawatts of power in one day. ERCOT predicts customer demand will reach 73,000 megawatts this summer. Unsurprisingly, much of the usage stems from maintaining cool temperatures in homes and businesses resulting in heavy reliance on the heating, ventilation, and air conditioning (“HVAC”) systems. Additionally, catastrophic lightning storms during these summer months are prevelant. 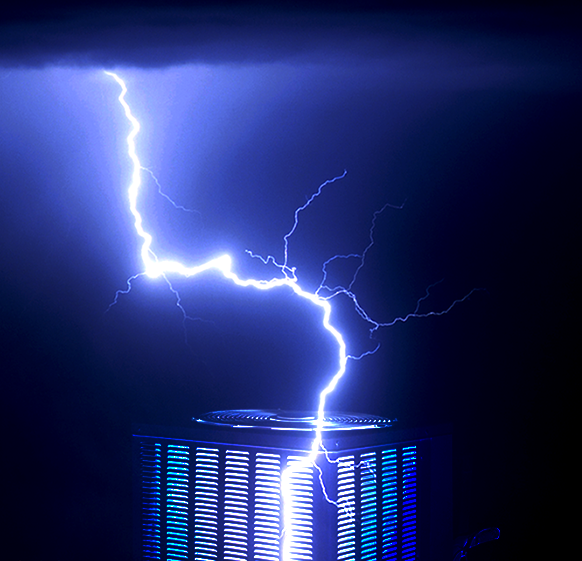 Property insurers receive more claims for lightning damage to the HVAC system. But often times, the purported lightning damage to an HVAC compressor has been wrongly assessed, and the actual cause of loss is wear and tear. Wear and tear is not a covered cause of loss. It is no surprise then that over 40% of claims are denied when the insured initially alleges lightning damage that is later determined to be merely wear and tear. If the HVAC is not properly maintained, the extreme summer heat only intensifies the existing stress on the compressor, and it could result in an uncovered loss. Misreporting is apparently common with both residential and commercial property HVAC damage claims. Data from 2015 sheds some light on the subject. For 2015 commercial claims, 35% of all HVAC claims were categorized as wear-and-tear, claim withdrawn or not damaged. Of the 45% of claims originally reported as hail damage, only 33% had actual damage. Of the 9% reported as lightning damage, only 2% of claims had actual damage. The intolerable heatwaves spreading across the nation inevitably generate heavy reliance on HVAC systems. Insurance coverage for HVAC claims probably does not include stress-related damage that has only been exacerbated by extreme heat. So, during the summer months, when our functioning HVAC systems are crucial to survival, insureds should be aware of the types of claims the policy may cover, tend to any existing wear and tear, and properly maintain the HVAC system…that is, if you want any chance at surviving the summer sizzle.